Situated in the Indian Ocean lies the tropical paradise of the Seychelles Islands – a group of 115 in total – which has become synonymous with the most relaxing holidays, romantic honeymoons, sparkling beaches, and island life. The attraction of holidaying in the Seychelles Islands lies in their pristine, unspoilt beauty, with diving, fishing and water sports topping the list of popular activities. The Seychelles beaches are known for being among the best in the world. Further inland, warm mountains blanketed with thick jungle gradually give way to spectacular oceanside rock outcrops and white beaches – with beautiful coral reefs visible through the crystal-clear water that surrounds the islands. 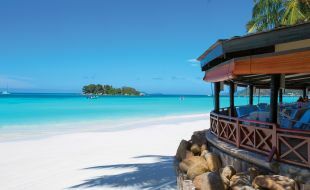 The Seychelles are a favoured holiday destination among travellers worldwide, with luxury hotels and spas dotting the major islands, coupled with the appealing prospect of exploring the surrounding islands, many of which are uninhabited. Many visitors island hop between the 16 islands that offer resort accommodation and explore the underwater world from glass-bottomed boats. A choice of restaurants offers visitors a choice of local Creole and international cuisine. 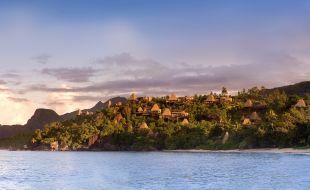 Yachting marinas, private resorts, and entertainment abound: the splendour of the Seychelles transcends nationality, and its timeless appeal is a source of wonder for visitors from all over the world. As for accommodation in the Seychelles, you are spoilt for choice. 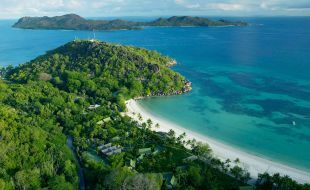 But few holiday resorts are as romantic and relaxing as Paradise Sun on Praslin and MAIA on Mahé. Both resorts offer luxury accommodation options, stunning views and a full range of activities and leisure choices. There’s restaurants on the beach, and then there’s beaches in the restaurant. Sand underfoot, the ocean lapping at the side, a high lathania leaf ceiling, 180 degrees of stunning aquamarine ocean and paper-white sand views are all complemented by an à la carte lunch menu of island-fresh Creole dishes and familiar-favourites with a tropical-twist at our Praslin restaurant.